← Conversation With…A Dried Flower…about the parts of ourselves that die. I’m soooo glad! Thanks for letting me know. Yay!!! Love it, I’m so happy to read this post, and I’m right there with you waving my quirky flag 🙂 It’s nice to not be alone in doing so!!! Ok, that open container-OK thing is really weird. Others, not so much. Ah Elaine, thanks for that vote of confidence in an area that makes me feel kind of insecure. Love you. I have a family full of quirky! I love it! Wouldn’t it be boring if we were all the same.. embracing my freak flag with you! OMG! I thought my “OK” on the milk containers was the freakiest freak thing anyone has ever done! You just made me so happy by telling me you’re as crazy as I am. You made my day! My week! My year! Yes! Let that freak flag wave! I love it! Lol Cathi. Travelled the world on Youtube and the OK sticker had me in splits. Yes, you always have the perfect solution to the problems. How lively the flag looks in the last pic with all those new eyeballs. Some to look outside and enjoy the world and some to look inward and keep loving oneself.. Maybe sometimes we really need more eyeballs to do that, don’t we.. Yes. I grew up in the 80’s/90’s but I’m obsessed with the 50’s. I feel like I belong in the 1950’s but somehow ended up here. I spent most of my life trying to fit in, but now I finally embrace my love for yesteryear. It’s very liberating. I think I could use a freak flag, or at least, a freak pennant. 🙂 Great entry btw. Of course, I love ALL your “Conversation With…” bits. So clever! Former Goth here; currently debating on if I want to publish around 10 poems written between 1989 and 2000. The problem is that it’s pretty dark, what now gets called “Gothic Poetry” because of the dark themes. I’d have to put notices on them “#TriggerWarning” most likely, because I do have a few readers with serious mental health issues and I am concerned that some of my stuff might be triggering (the most triggering I won’t likely be publishing because of this). By the way I liked your book. I hear ya re: over-sharing when flying the freak flag–especially if some readers might be triggered in a negative way. I think the fact that you own your Gothiness is what matters most, just like I’m trying to own the ridiculously-fearful side of myself. Maybe who we share it with is secondary? Also–I’m so very happy you liked my book. That means soooo much to me! You’re quite welcome….true story, I now think of that book every time I see googly eyes lol. Here’s to celebrating being Quirky and the special person that you are. We all have our own little ‘quirks’ and so refreshing to read about not apologising for them and standing up for our own unique qualities. Have a great weekend! Thank you so much for your quirk support. It feels freeing as I grow older. Have a great weekend, too! 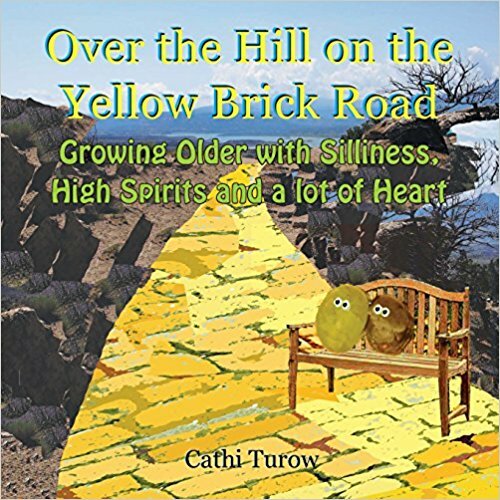 Cathi – Your talent, insight and creativity is remarkable. I love reading your work!! About 25 years ago a friend said ‘I love your eccentricity and oddness’. I thought I was fitting in with the norm of the place i lived in perfectly …. had no idea my innate quirks and creases were showing and I was a teeny bit mortified. A couple of weeks later, sleepless after chewing on what it was that I was doing that revealed me as weird, I made an unguarded remark that led her to the truth. ‘Oh no!’ Said she ‘are you upset by what I said? ; ‘yes’ replied I ‘But darling, it’s the fact that you are odd and strange that makes you. And we all love you. Never change. Never try to be anything else’. We are still friends and I have striven to be friends with freaky me ever since. Wave that flag for the love of you. What a great freak story! And I love that you’re surrounded by people who “get you” and love you for it. I think I was the most comfortable with myself years ago at one of my jobs, where I was a member of a writing team of about twenty people. We were all “off beat” in the same ways. For example, if we had a meeting scheduled in the office and one snowflake fell from the sky, there was no way we were going out. Everyone stayed home and hid under their beds. Ah, the good old days. We’re all tattered in some way, and the best thing is to fly that flag proudly! I LOVE being quirky. Wave that flag, my friend! Thank you! And you keep waving your flag along with me! Long live the tattered, quirky freaks! (Just telling you this…in whisper)…TATTERED QUIRKY FREAKS ARE THE BEST!! Love the line, “Fly my Freak Flag.” And the ending was great! Yaaaay! The strangers are lucky you got past your quirkiness. It gave them the great opportunity to meet you. Yes to flying the freak flag! This is so affirming. I’ve been moving in this direction of not apologizing and embracing the fact that I am the crazy tree lady and compulsive recycler who carefully checks toilet paper 4 packs in the store to make sure they have no punctures or breeches of any kind. I’m sure there’s more I could add, but whatever it is, I’m gonna be proud! Taking the stairs is way more healthy than the elevator. Your beautiful art work always makes me so happy, so I’m glad I had a chance to make you happy too. Freak flag flyers rule. Thank you so much! I’m so happy you enjoy reading my blog! Thank you thank you thank you! Ann! Thanks so much for sharing your specific freak flag behaviors. It made me feel right at home. Your idea to put the dates on all your opened foods instead of the word “ok” kills two birds with one stone. You know the food was opened by you, and you know when it has to be thrown away. I’m going with your method. Thanks! We all have our own quirks and oddities. I have my fair share as well since I have OCD, and every time I arrive at the office I clean my workstation as if it hadn’t been touched for years although I’m the only one who’s using it, and all my colleagues look at me as if I’m crazy every single time. I have my own ways of doing things and some people may not like it, but I have given up on caring what other people think of me a long time ago. I’m proud of my quirks, and these things make me who I am. Thanks so much for sharing your OCD-ish-ness. I don’t clean my work area every day, but I do have OCD freakiness with clean silverware and plates. If I drop something I’m about to use to eat food , I have to put it in the dishwasher. Just washing it off doesn’t do it for me. I do the same. It seems OCD comes in many forms. Ha ha! When I was a little girl, my stepmother used to bake cakes, wrap them in aluminum foil, label each one “meat loaf,” and put them in the freezer. That way, she thought my sisters and I wouldn’t eat a whole cake in one sitting (she hid all the cakes that way). Obviously, it didn’t work. We all have some freak-and I agree . . it is ok! Right on! Freaks make the world a more colorful place. Ha ha! Yes! I love your suggestion to add more eyeballs. I’m on it! I’ll fly the freak flag with you! More eyes. Or maybe ‘ayes’ (yesses). Yes there are. Really enjoyed this post. Thank you so much for sharing. Aren’t we all just a little bit quirky. My parents used to tell us “weird” was a good thing. My sibs and I learned to get our freak on years ago.